Tuesday afternoon in Kennebunkport was fast becoming Tuesday evening in Kennebunkport by the time I finished taking pictures of the interior of the Captain Lord Mansion AND it was starting to get rather gray and chilly so I figured I'd best get myself outdoors to take some exterior pictures before I had absolutely no light to work with. 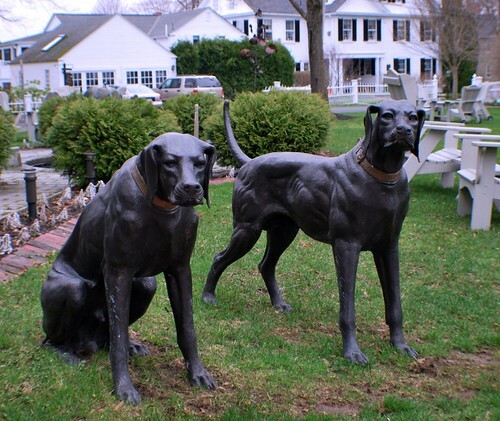 Even though I totally forgot to ask about the dogs' sculptures I'm pretty positive that they were done by a local artist as the Captain Lord Mansion really supports the local arts as evidenced by all of the wonderful paintings that were for sale and some of the wonderful goodies in the Gift Shop. 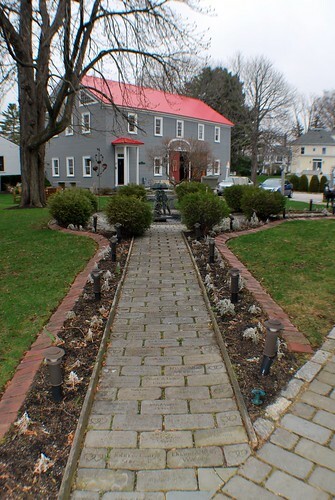 At one time the Carriage House located behind the mansion was also an art studio so you know that the arts are near and dear to innkeepers Bev and Rick. 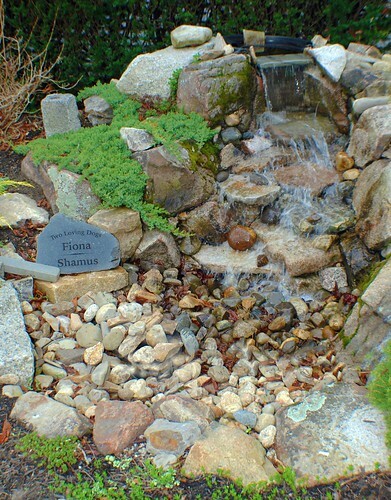 As beautiful as the one-acre grounds around the house are, one thing in particular makes them really special and that's the Memory Garden that was started in 1993 to honor guests who had stayed at the mansion ten times. 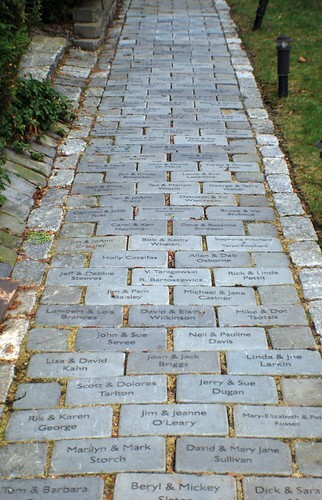 The stone pavers that are used to honor frequent guests are engraved after their ninth visit (at which time they are asked how they'd like the paver to read) and upon their tenth visit, guests arrive to find the paver - which is made of 500 million-year-old, Appalachian bluestone - has already been made a permanent part of the Memory Garden. 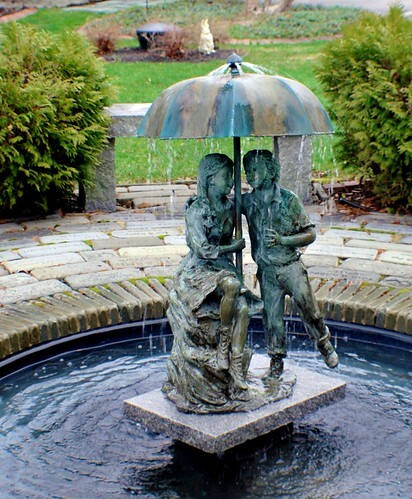 The paths lead up to and surround the garden's "Fountain of Love" - a weathered copper statue of a couple cuddling in the "rain" under an umbrella. I asked Rick how many pavers there currently were in the Memory Garden and he told me that there are over 500! 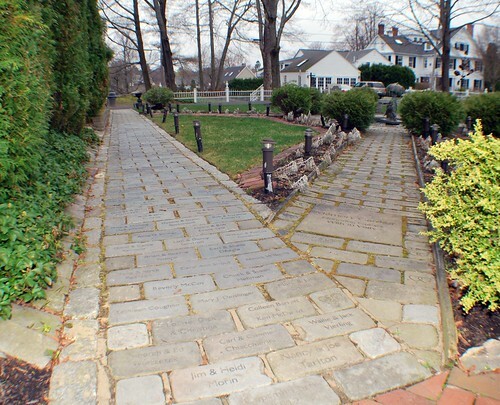 Stones are also placed in the garden for employees who have reached their ten-year anniversary making them a permanent part of the Captain Lord Mansion also. 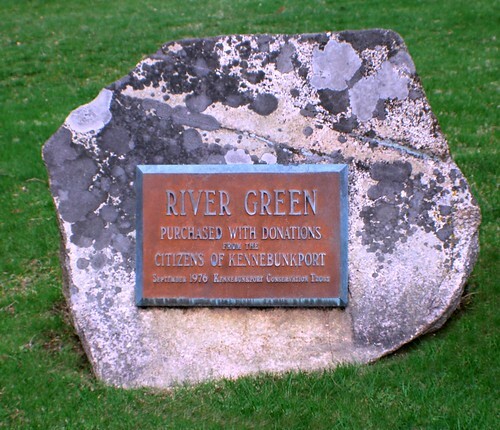 The stones in the Memory Garden aren't the only gifts that guests of the mansion receive as Bev and Rick believe in recognizing those loyal guests who return to the inn time and time again. Each time a new guest comes to the Captain Lord Mansion shortly after they return home a beautiful engraved pen and a $25 gift certificate to use at the inn upon their next stay arrives. Upon their second stay, fresh baked cookies are awaiting their arrival in their room and thereafter for every fifth visit, guests receive special gifts including a cut glass bud vase on their 5th visit, the personalized stone in the Memory Garden on their 10th visit, a cut glass candy dish on their 15th, a large cut glass vase on their 20th, and a set of cobalt blue salt and pepper shakers with silver tops on their 25th. Once guests reach that milestone then the innkeepers start getting creative based on what they know about the guests and their interests. 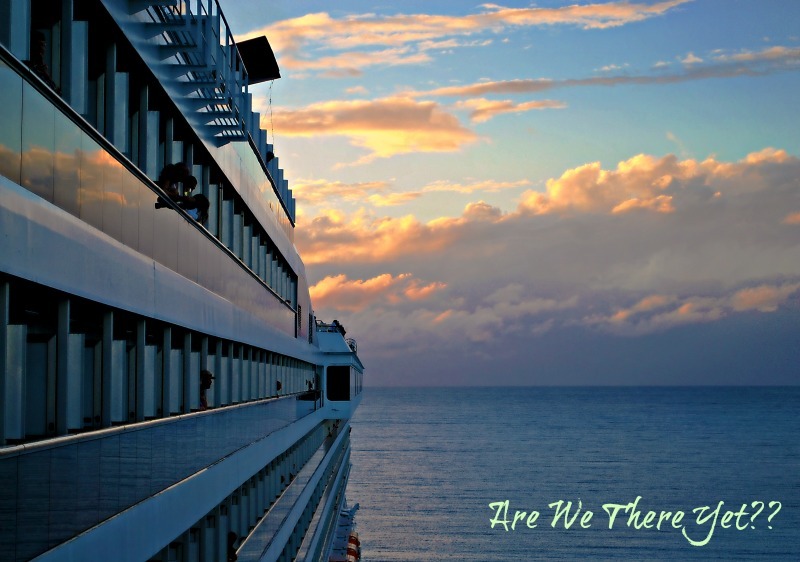 A couple who celebrated their 80th visit in July of 2009 were awarded a very special harbor cruise - I can't wait to hear what they get for their 90th visit! 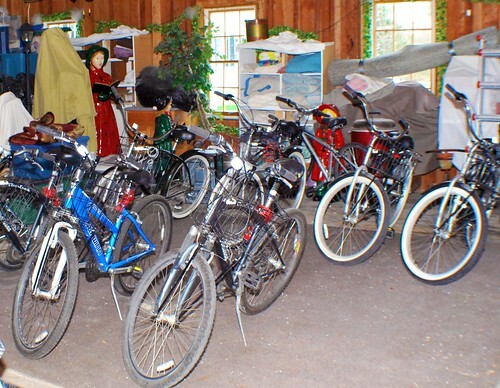 The 5,000-square foot Carriage House which can be seen in the picture above just to the back of the fountain, serves as a storage area for the mansion as well as a good place to park the bicycles that are available for guest use along with snowshoes and other recreational amenities that are available. Honestly, I really do believe that they think of everything that a guest could possibly want and have it available just in case someone asks! Oh ... and I have to say that peeking at some of the stored Christmas decorations made me believe that Christmas at the CLM has got to be pretty special, too! 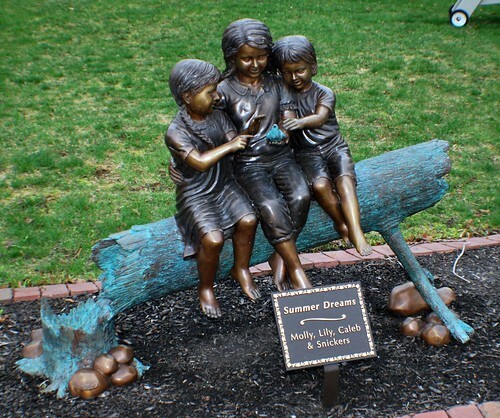 The sculpture above entitled "Summer Dreams" sits alongside Pleasant Street which is the road that the mansion fronts on and separates it from the River Green - a rolling lawn that leads down to Ocean Avenue. Standing in front of the mansion, you can just see the cupola on the roof. 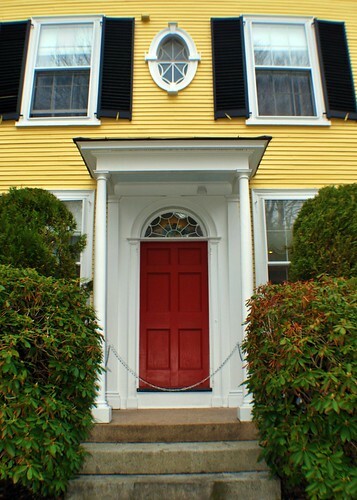 This is the front door that leads into the entryway by the Merchants Suite and is the formal front door of the mansion. 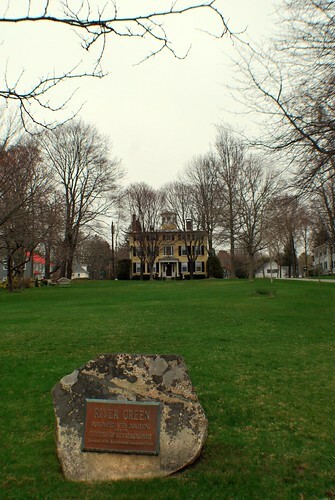 The pictures below were taken from the River Green looking back up towards the mansion. 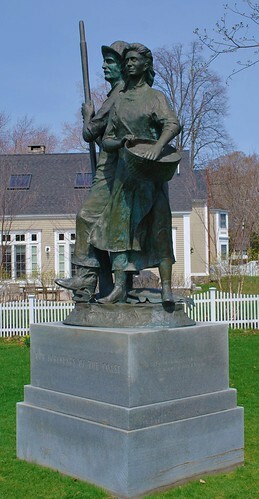 This statue that stands on the Green is named "Our Forebearers of the Coast" by traditional artist Frank Handlen who was commissioned to create the bronze statue in 1994. 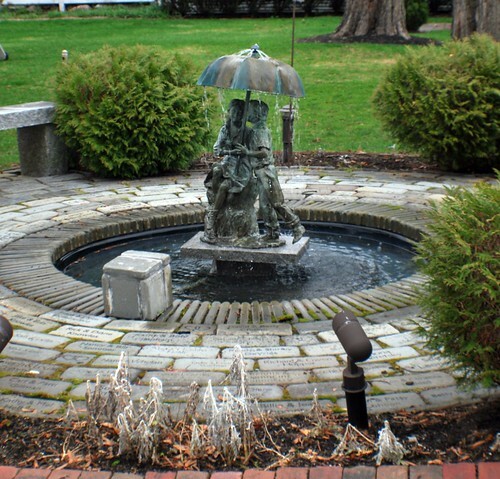 The model for the statue was made in the Captain Lord Mansion Carriage House. After I had walked back up Green Street next to - what else? - the Green, I took a couple pictures of the side of the mansion that my room was located on. The part of the house that bows out is the window seat in the Gathering Room and directly above it are the windows to my room. Following my tour around the outside of the mansion I went inside and asked for directions to the closest lighthouse which I hoped to find before it got much more overcast. I was given not only directions but they were printed out precisely on an index card that made it quite easy to find the lighthouse! Like I said, they think of everything! I'll be sharing that part of my trip with you in the next post but for the rest of this one I'm going to skip ahead to Wednesday morning when I awoke after sleeping on what I described as a "silk-covered cloud" - i.e., that beautiful four-poster bed in the Callender Room! To answer my own question - yes! - it was most definitely as comfortable as it looked and it would have been tempting to just stay in bed right up until check-out time were it not for the wonderful smells that were wafting up from the kitchen and the lure of the hydro-massage shower and heated bathroom floor that awaited me! When I made my way downstairs at 9:45 after possibly one of the longest showers I've taken in a very long time, I found the tables set and Sue Bouley, our cook for the morning, getting everything ready for myself and the other guests who were probably getting pretty hungry based just on the wonderful smells alone. Sue recently celebrated her ten-year anniversary with the CLM and she was a delight to talk to as she answered any and all of my questions. As I sat down at a table with two couples and the one other lone female at the mansion (a hair stylist from Minnesota), Sue asked if there was anyone new and I rather sheepishly raised my hand. "Oh yes, you're our travel writer!" she said. Ah, there they were again, words that really made me smile! Turns out that I sat down in an ideal spot as I ended up talking to Tom from New York who, along with his wife Rene, were on their 15th visit to the mansion. Tom was more than happy to tell me all about the area and some of the wonderful places that he and his wife had been to on some of their visits over the years. It was easy to see that he genuinely loved it there as we chatted amiably over yogurt and cereal, fresh-out of the oven cranberry muffins, mini-Belgian waffles with warm maple syrup, country sausages, and the best soft-boiled egg I've ever eaten - Sue said it was a little overdone but you could've fooled me! With another couple from Massachusetts who were on their 8th visit to the Captain Lord Mansion sitting across from them, I asked Tom how he had first heard about the mansion being that he and his wife were from close to Syracuse and he told me that he'd read about it in that venerable New England magazine that I admire so much - Yankee Magazine. As a matter of fact, a lot of the wonderful places that he was telling me about were ones that he had originally read about in Yankee and then checked out in person. Tom really was a fount of knowledge and it was great to talk to him! Before we said our good-byes he even asked me where he would be able to read my posts about my stay and Sue provided pen and paper so he could write down my blog address. It was about that time that I was beginning to think that if I was going to really try to be a travel writer that I might want to invest in some business cards just in case someone else ever asks me where they can read my scribblings! Following the wonderful family-style breakfast, I packed up my meager belongings and gave the Callender Room one more long nd lingering look before I shut the door behind me and made my way down to Reception to check out. 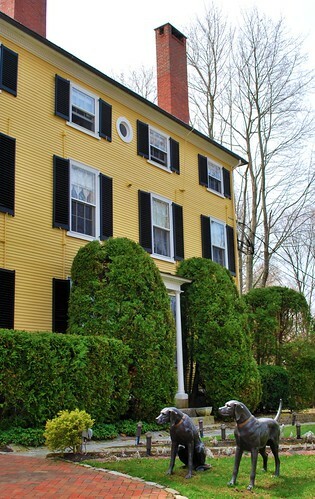 I chatted with Rick for awhile about the history of the house and then asked him if there was one thing that he wanted people to know what would it be? He considered my question for a few moments and then said that what he felt was really important was that people know that a stay at the Captain Lord Mansion is an experience and not just a place to hang your hat for the night. 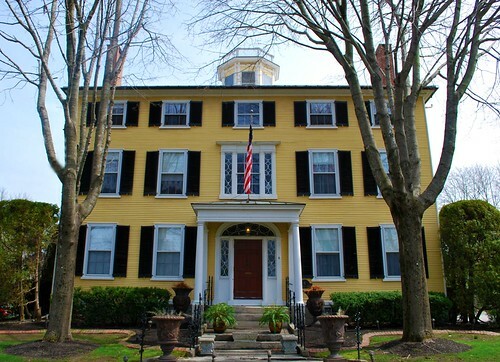 If you're simply looking for someplace to stay and don't really care about your accommodations, there are lots of places for that but if you want to go to Kennebunkport and be treated lavishly and treat yourself to a true bed & breakfast experience then the Captain Lord Mansion is definitely the place to stay. He and Bev have made the mansion a premier place to visit and yes, even though it's what a lot of people might call expensive, o' boy is it ever worth it. There's an old adage out there that "you get what you pay for" and at the Captain Lord Mansion that is definitely true as you what you pay for is a wonderful experience in a wonderful setting with wonderful staff to take care of your every need. If you go home unhappy then there's something wrong somewhere as I really just can't see it happening. 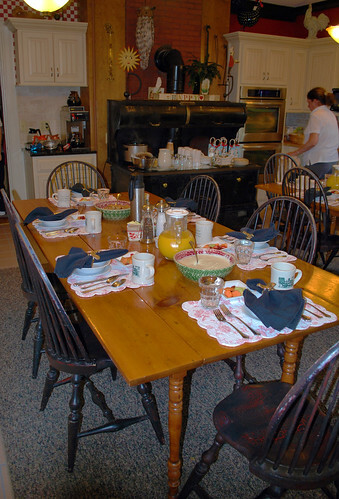 Not in such a special bed & breakfast like that and not with two innkeepers and staff that really care about their guests and their experience. One of the best ways that I can sum up my trip is to say that when I got home on Wednesday evening, I walked into my bedroom and just stood there for a few minutes looking at a room and bed that I had always thought of as comfortable before and being quite disappointed that I wasn't spending another night in the Callender Room where I had felt like a princess. It's true that there's no place like home but there's really no place like the Captain Lord Mansion either! In conclusion, I'd like to extend a very big thank you to Rick and Bev and the entire staff at the Captain Lord Mansion for giving me the chance to come up and stay and explore the mansion and experience all that it had to offer. It was a totally amazing trip and I sincerely hope that it doesn't take me another nine years to get there again! Now what are the rest of you waiting for? 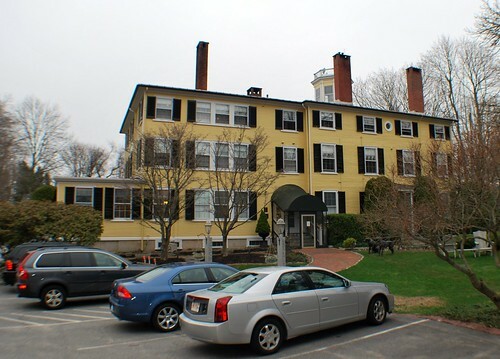 Like the Captain Lord Mansion on Facebook, follow them on Twitter, read the latest news on their blog which will point you in the direction of some great offers and deals, or simply contact Rick and Bev the old-fashioned way then get thee to Kennebunkport and an experience of a lifetime! *All pictures from my stay can be found on Flickr. Oh, it looks absolutely perfect! I want to stay there one day! It may be the perfect spot for a sisterdear weekend! ANd I love Kennebunkport! It's just a town over from where Lynda and Rick's lake house was. Alas, they sold it a few years ago. 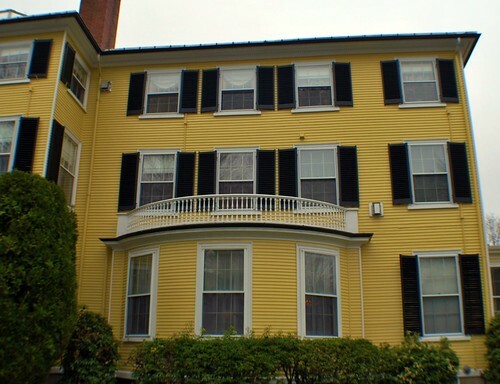 But a lovely Maine B&B would be such a treat! I'm glad you had such a grand time. Good for you. What Bee said. This place just gets gooder 'n gooder! I've been enjoying your Marvelous Maine Mansion. It looks like a wonderful place to visit and I'm glad you finally made it there. And I think you'd make a fantastic travel writer! I think you should shoot for the cobalt blue salt and pepper shakers! 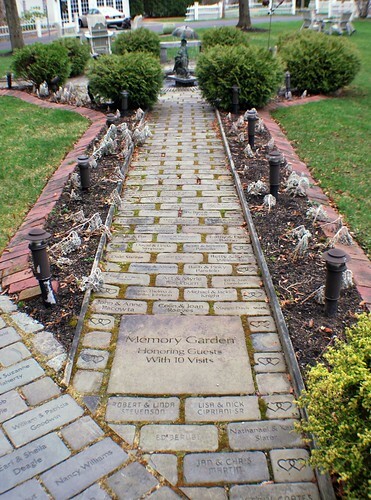 That pathway is such a terrific way for the visitors to have a lasting memory of their favorite vacation spot. What a fantastic job they've done! BTW: Thoroughly enjoyed this excellent travelogue! You've probably inmcreased bookings for that place!